New Jersey State law requires transporters bringing solid waste to the Reclamation Center be registered with the NJDEP prior to engaging in hauling. Exempted from this law are persons transporting only their own household solid waste in passenger automobiles, bearing general registration plates. Persons transporting only their own solid waste in vehicles registered with a State motor vehicles agency as having a maximum gross vehicle registration weight (GVRW) of 9,000 pounds for a single vehicle or 16,000 pounds combined maximum GVRW for a vehicle pulling a trailer. The MCRC does not provide solid waste transporters with hauling permits. They must be acquired from the NJDEP. Those transporters who haul waste generated by other sources (non-self generated) must be fully licensed by the NJDEP. For more information on this license, contact Roxanne Feasel of the NJDEP at 609-341-5475. 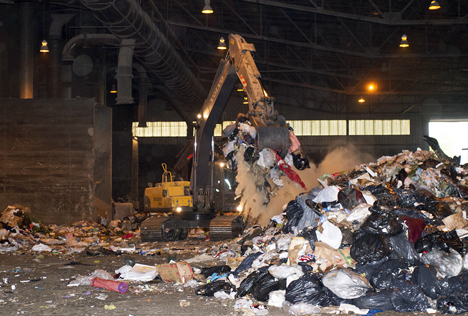 Those businesses, which haul waste, which is exclusively self-generated, may apply for a permit exempting them from the licensing requirements. Businesses may complete the interview process for this permit in the Monmouth County Health Department (MCHD) office located at the Reclamation Center. This procedure includes completion and certification of all necessary documents to expedite the applicant’s paperwork processing at the NJDEP Compliance office. Contact the MCHD at 732-683-8686 ext. 5650 or 5652. A secured (prepaid/escrow) account, must be setup through the Monmouth County Finance Department at the Reclamation Center's Scales Office prior to dumping. The application can be picked up at the MCRC Scale Office, the County's Finance Office or by clicking this link Monmouth County Prepaid Account Application. For more information on the Escrow account, contact the Scales Office at 732-683-8686 ext. 5600 or 5601.